USS Medusa was the first United States Navy ship built as a repair ship. With a capable crew of qualified repairmen, USS Vulcan was kept in good repair for a long service life. The United States Navy became aware of the need for repair ships to maintain Asiatic Fleet ships stationed in the Philippines. Two colliers were converted to USS Prometheus and Vestal in 1913 before the purpose-built USS Medusa was completed at the Puget Sound Navy Yard in 1923. Japan found repair ships valuable for Pacific island bases. The pre-dreadnought battleship Asahi was modified and recommissioned as a repair ship in 1938. The 9,000-ton purpose-designed repair ship Akashi was launched in 1938 as the intended prototype for a class of five ships, but the remaining four ships were cancelled as other wartime shipbuilding projects assumed higher priority. Lenton, H.T. ; Colledge, J.J. (1964). 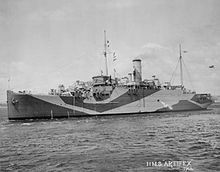 British and Dominion Warships of World War II. Doubleday & Company. This page was last edited on 15 August 2018, at 21:43 (UTC).